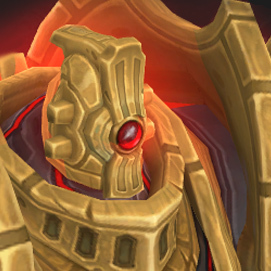 As a small company of just 3 whole people (and 1 dashingly good-looking robot), we are just really happy that you’re trying out the tools we’ve built and updated for BfA. 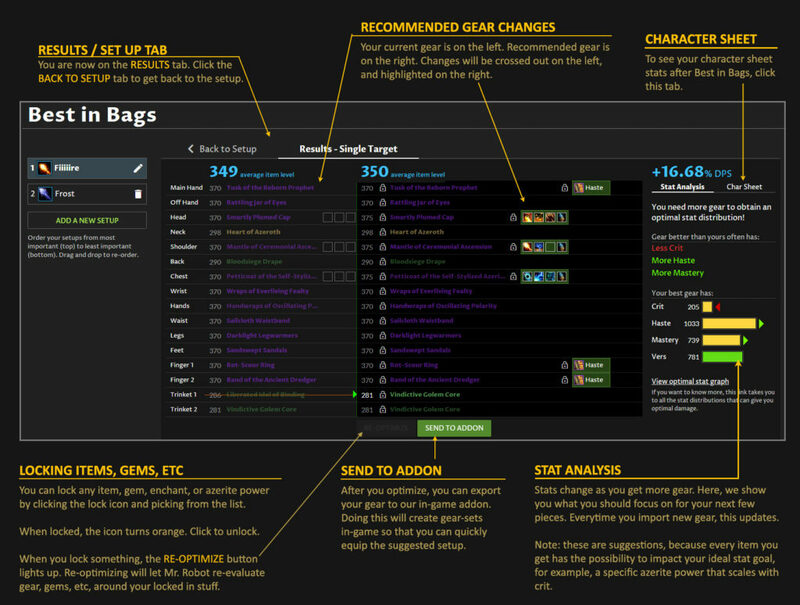 If you like the tools enough to upgrade, we keep the price low so you can spend more money on Warcraft. Upgrading (and gifting) is just $2 a month, or $12 if you pay annually. 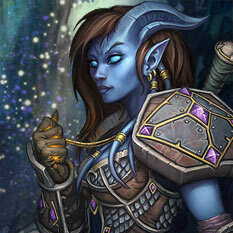 You can sign up your guild (or group of friends) for a 20% discount. (Cancel anytime online, no hassles). To use these features, go to AskMrRobot.com and load your character. 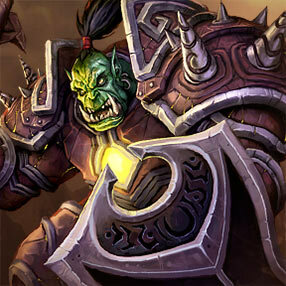 To get the in-game addon, get it from our site, or Curse/Twitch. (The video states now-sept 5, but it is actually Sept 4-5 and you just found this post early). If you have a few minutes, take this 8-question Uldir survey about what addons you use, and other raid-related questions. If you are looking for more information on Uldir, I’ve got you covered! As you’ve leveled up and been running dungeons and world quests, you’ve accumulated a lot of gear. What are you best items? Should you equip a higher level Azerite item even though you can’t unlock the powers? 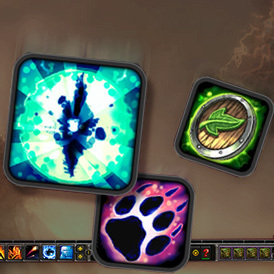 Speaking of that, what Azerite powers should you get for raiding? What gems and enchants? 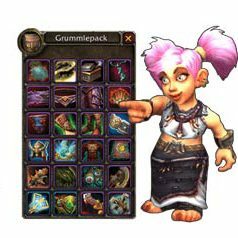 In BfA, we’ve already simmed your gear to find the answers, so you don’t have to. No more time spent simming (unless you really want to, and that’s cool too), because we already simmed it for you. Yep, we’ve simmed all of the necessary talents, gear, and Azerite powers that you can get in BfA. 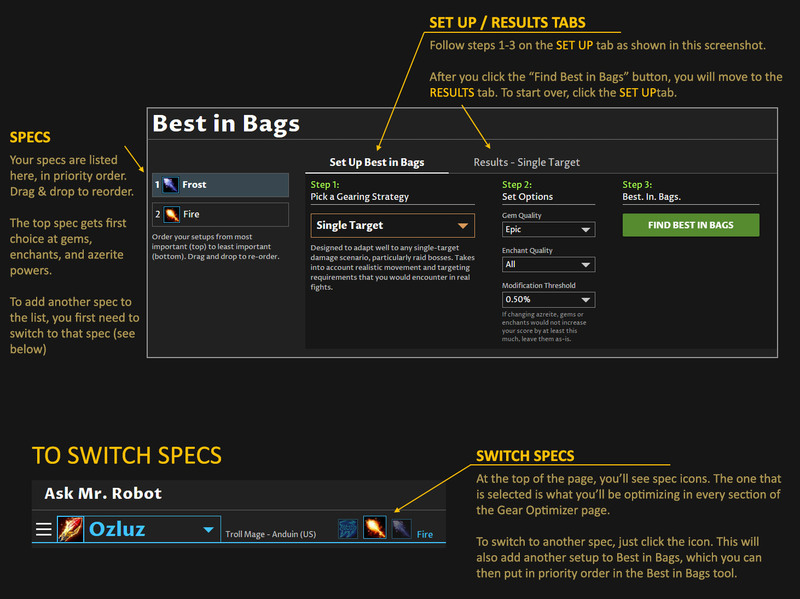 Then Best in Bags looks up the simulation results and gives you an instant answer, with the click of a button. Below is a picture tutorial of the UI. If you want more details of Best in Bags, check out this post. Which bosses have the best upgrades? What dungeons still have upgrades for me? Where should I spend my bonus rolls? 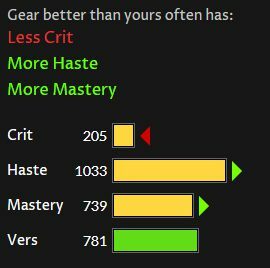 If I get titanforged or socketed items, are they better than what I currently have? These results are also based on simulations that we’ve already done for you, letting us give you an instant and accurate answer. The bonus roll feature is probably the biggest fan-favorite. But with raiding, I really like the regular raid view – it lets me search for anything that drops in the raid. For example, I might filter the list to see weapons, or all items with crit, or items with a specific Azerite Power. I also like using it for trading. If someone has an item to trade, I can search for it by name and get an instant answer on how big of an upgrade it is (or isn’t) for me. Here’s a 1-minute silent video showing some of these functions.